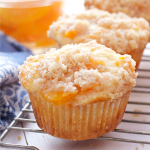 These Peach Cobbler Muffins are the perfect sweet snack! This is such an easy recipe that taste's just like Grandma's peach cobbler! And the best part? They're even easier to make than a traditional cobbler and have the perfect crumble topping! Preheat your oven to 350 degrees Fahrenheit and prepare a large muffin tin with 8 muffin cups. Add the flour, baking powder, salt and sugar to a large bowl and whisk together to combine. Add the peaches, reserving about 3/4 cup for topping the muffins, and stir to coat. Add the milk, egg and oil and stir together with a rubber spatula just until the flour disappears. Portion the batter out into the muffin cups evenly (about 3/4 full). Combine the flour, sugar and cinnamon in a small bowl and stir. Add the cold butter in chunks and break it up with your fingers in the flour mixture until it resembles coarse crumbs. Top the muffins with the remaining chunks of peaches and a spoonful of the streusel topping. Bake at 350 degrees Fahrenheit for about 20 minutes until golden brown and a toothpick inserted into one of the muffins comes out clean.